just because they seem incredible. Buona sera. I have had the opportunity on several occasions to actually use what passes for logic in some atheists' minds right back at them. Since this experience is spread out over several Weblogs and over a period of time, I will give you the distilled essence. But first, caricatures of how it feels to be on the receiving end. Sitting at the table, counting out my medications and putting them in dispensers for the week. A pill rolls off the table onto the floor. Later, I say, "Oh, no. I'm one pill short for the week!" The atheist watching me says, "There's one on the floor. You have the exact amount. You're a liar!" Teasing an atheist, I joke, "Does what you said really pass for rational speech on your planet?" 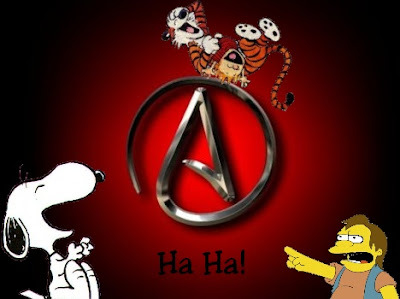 The atheist shoots back, "Liar! I'm not from another planet, and you know it!" Reading the weather forecast on Monday, I say, "It looks like it will be nice all week. A bit cold, but no snow, rain or sleet". Thursday rolls around, sleet turning into all rain happens. The atheist says, "You said it would be nice all week. You're stupid as well as a liar! You are a fake Christian! There is no God!" In the first instance, someone takes advantage of a simple mistake. The second example is of someone who chooses not to recognize humor or sarcasm. Third, things happen that are not under anyone's control. As I said, these are caricatures, but some people act that desperately to find something — anything — with which to attack a Christian. God forbid that a Christian is allowed to be right on something. By the way, do people still use the expression, "In your face?" Some do? That's groovy, I don't want to use outdated slang. Here is a two-in-one "in your face" example of giving atheists' logic back to them. To begin, I made a bad joke about someone having a drunken one night stand with a prostitute and confusing it with marriage. (Hey, I said it was bad!) So, in his desperate, twisted mind, Arvel Atheist screamed, "You just called my wife a whore!" Like I knew he claimed to be married in the first place. Nice job at lameness, Poindexter. (Hey, maybe he didn't want his alleged wife to know about — never mind.) They'll grab any excuse to attack, remember. He demanded an apology for something that I did not say. So, I used his atheist "morality" back at him, taking it down the road of its own "logic". Since he is an atheist, he has no absolute standard for morality. So, even if I was guilty of his accusation, what difference does it make? If there is no God, everyone makes their own rules. He should respect me for going by my rules of conducat while he goes by his rules. But by crying, "Foul! ", he implied that there is a higher standard; he appealed to an ultimate standard. There is only one source for that: God. So, the atheist appealed to the God that he says does not exist, instead of being consistent with his own faulty "morality". I managed to make things worse for him. The second thing I did was to say that he was probably pretending to have a wife. After all, atheists are known for skipping marriage and simply living together. This guy, and many other atheists (especially online) are notoriously dishonest. I said he was probably being a typical atheist and lying about having a wife. Someone who claimed to be his wife commented to me that she is his wife. I replied that she is an admitted atheist as well, and probably lying to help him out. She offered that she has proof. Well, that can be faked. And I have never seen her in the first place. Just because someone has evidence for marriage, and the testimony of witnesses, does not mean that it's true. I do not have to believe it. Atheists are liars, anyway, and they have no moral standards. How do you like it? Back atcha. In your face. Ha! This is the same crap that this guy (and many other atheists I have dealt with) will shovel at you. There is no God because I can't see him. I don't believe any evidence that the Bible is true. You're a fool for believing in him, anyway. Christians are stupid and dishonest, and will say anything to get you to believe in their God (an appallingly stupid remark that I have encountered many times). OK, prove to me that God exists. Right here, right now. Probably gearing up for the atheist holiday on April 1. Even when you catch them in their logic flaws, they deny it. So, don't waste your time with someone who is obviously resistant to what you have to say, is incapable of learning (or simply unwilling), whether it is a discussion on the existence of God or about your work habits. I am not kidding myself that these people will learn. But my sensible readers can learn from their mistakes. Addendum: The geniuses came along and complained about the post (one of which has been banned for weeks). Although I did not give names, they identified themselves in the comments. Inspiring intellect! And then, the male bravely deleted his comments! Also, a pretend Christian judged me harshly in the comments. Buona sera. Looks like it's media weekend here, huh? I'm going to close it out with a piece of audio. I have been listening to the podcasts of "Evidence 4 Faith" Christian apologetics. They had been doing some material on critical thinking skills, logical fallacies and the like. 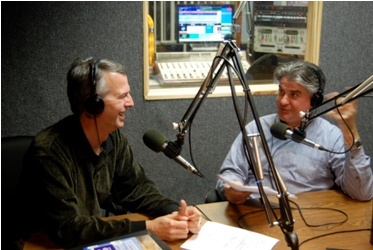 Before they went into their March 13, 2011 discussion on "What Makes a Good Argument", my letter was read on the air. This is further verification of my discussions with Rev. Matt Slick of CARM regarding the obstreperous nature of Internet atheists. Two of my pet trolls are mentioned, and it turns out that Keith and Kirk have the same kinds of problems that I have. Obviously, they have more than I do because they have been doing an apologetics ministry for several years. (They said that I have a "ministry". Well, I sort of have one, but this is not it.) By the way, I wonder if Keith Kendrex has heard the "Made in Europe" version of "Stormbringer" by Deep Purple, because the manner in which he said that word reminded me a little bit of the way David Coverdale introduced the song. If you want to hear the full 52-minute podcast, you will have to go to the link above, click on "Podcasts", and look for "What Makes a Good Argument, March 13, 2011". The player is embedded in the site. Or, you can hear them discuss my letter, below. It takes less than six minutes.